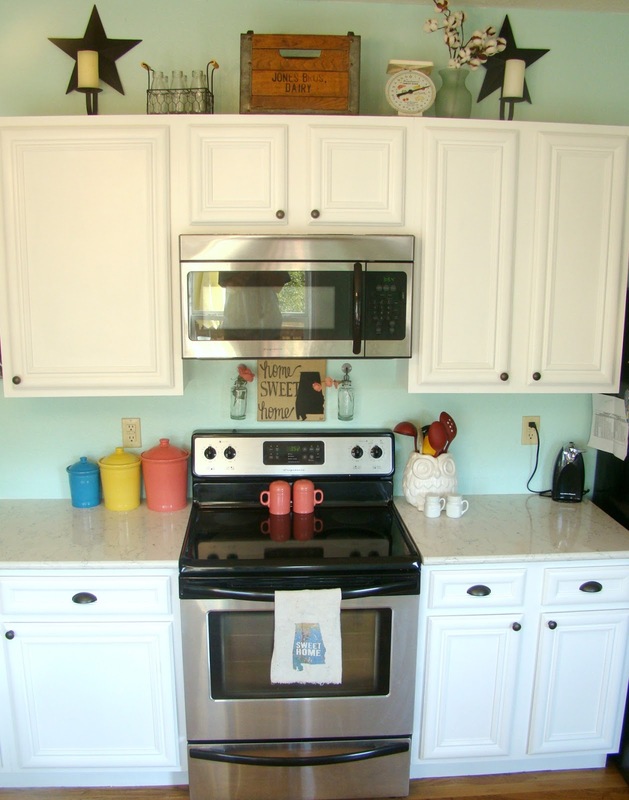 Southern Bluebird Day: Painted Kitchen Cabinets Reveal! It has been a long, tedious process, but y'all. My cabinets. Are. Done. I really wish it didn't take me three weeks to finish. And I really wish I didn't just finish up adding hardware and doing touch ups at 11:00 at night, but we can't have everything we want, can we? I guess unless what we want is a gorgeous white kitchen! We have since repainted the walls, painted the table and chairs, replaced the countertops, and painted the cabinets. This room is so bright and airy now. I love how it changes the whole feel of the room! And when the afternoon sun hits those gleaming cabinets, they just shine. I won't go into a detailed tutorial on how I painted these. There are eleventy billion cabinet painting tutorials on Pinterest. I know, because I read every single one of them before I finally convinced myself to just do it already. I will tell you some things I discovered during the arduous three weeks I worked on them. 1. This project will destroy the rest of your house. Maybe not literally, but in some ways, yes. See, I chose to work on these cabinets as I had the time, and I did them all by myself because I'm a control freak thorough. I work in the salon at least three days a week, and I have a busy three-year-old and a new baby. That means weekends when they were home with me were not an option. So my off days (and baby was home with me those days!) and late nights were when I powered through the big stuff. I did everything in sections and that meant that, for three weeks, every surface in my kitchen was covered with half-painted cabinet doors or drawers. I felt like it was futile to do much cleaning when everything was perpetually wrecked. I think my floors didn't get swept once in three weeks, and my counters barely got wiped down. Gross. 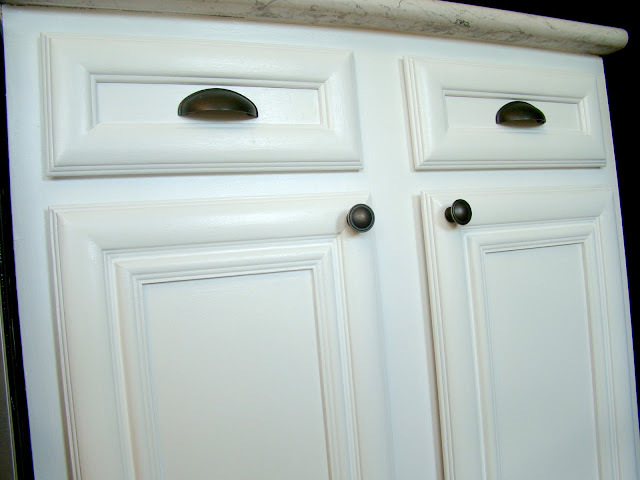 It made me crazy, but I had to focus all my attention on the cabinets so I could GET THEM DONE. I had to be okay with the state of the rest of the house suffering for a short while for the sake of the project. 2. Take your time with the primer coat. I am an impatient perfectionist, which is a terrible combination. I chose to use an oil-based primer for its durability and stain resistance, but I haaate working with it. It's usually smelly and impossible to clean up. Due to my impatience, I'm just not the kind of girl who is going to scrub oil-based paint out of a brush, so I pretty much threw away every one I used. That meant I used a cheapo brush for my primer coats, and I think that was a bad choice. Your top coat is only as good as your primer coat, and even though I used a high quality foam roller and Wooster brush for the top coat, I had more brush marks and uneven places from the primer. This bothers the perfectionist in me. I did sand between coats as needed, but that didn't fix every spot. I either should have primed everything at once, or just sucked it up and bought several high-quality brushes made for oil-based paint. 3. Floetrol is your friend. Floetrol is a paint conditioner you can add to water-based paints (they make Penetrol for oil-based) that slows down the drying time so that it's easier to go back and smooth out those brush and roller marks, plus catch drips before they're dried. When I mentioned using Floetrol to my favorite paint guy, he was impressed with my insider knowledge. According to him, most people don't know about this little product, so I'm telling you all about it. You add about eight ounces to a gallon of paint, and it's perfect for a project like this, or when you're painting furniture, and want the smoothest finish possible when using a brush. This was, and still is, the hardest for me. 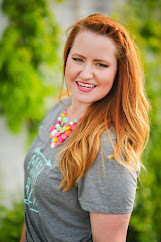 I'm all about living an imperfect life, but that doesn't mean it's always easy for me. I notice all the little drips and every brush mark. But you know what? I'm not a professional painter, and I don't live inside Pinterest. I'm a real girl with little kids, and I did the best I could. I doubt the painted cabinet police is going to come by and inspect my work and give me a bad grade. I think they look pretty all right. If you've been wanting to paint your cabinets but you're nervous/afraid/unsure, I am giving you permission to just do it! Don't worry about that your grandmother thinks you should never paint wood. Your grandmother (probably) doesn't live in your house. Also don't worry about what the future buyers of your house will think of your choice. They also don't live in your house. 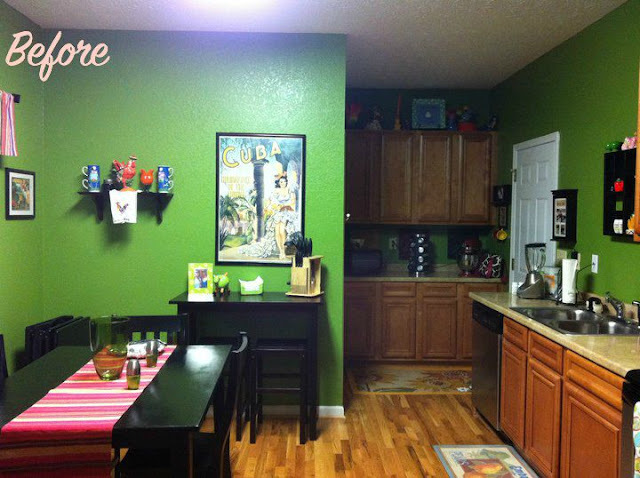 If you walk into your kitchen every day wishing it looked different, then change it. It was time-consuming work, but truthfully anyone can do it, and it's one of the least expensive updates you can do in a kitchen. I spent around $200 (including the new hardware) and it was so worth it. You could choose to use a paint sprayer if you're comfortable with that. I didn't because I don't have a good place to spray outside (I was worried about dust and dirt settling in the paint out in the garage), and I don't live the kind of life where I can tape and mask off every corner of my kitchen. I also chose not to sand beforehand, and I think only time will tell if that was a good decision. The doors have tons of grooves and raised sections, so sanding them would've been difficult anyway. I used two coats of the primer and sanded as needed in between coats. The paint color I chose is Benjamin Moore's Chantilly Lace in semi-gloss. It's a pretty cool white with some gray undertones. 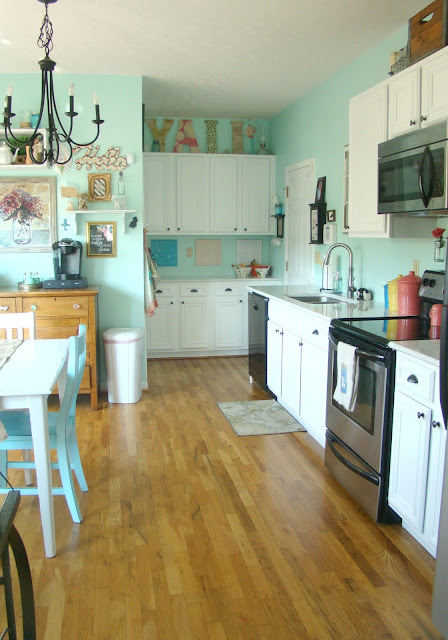 Since my walls are that minty blue, I didn't want to go too warm with the cabinet color. Plus, this room gets mostly afternoon sun, which tends to be warmer in tone (think about the light coming from a sunset), and I didn't want that to affect the look of the cabinet color too much. I did two to three coats of paint. Previously, our cabinets had no hardware at all (builder's grade cheap), so I bought these knobs and these cup pulls from D. Lawless Hardware. Shipping was free, so for all my doors and drawers, I only spent $60! I went with the oil rubbed bronze to tie in the black from the appliances and light fixture, but mainly because I like it :). I've also recently gotten some questions about the material we chose for our countertops. 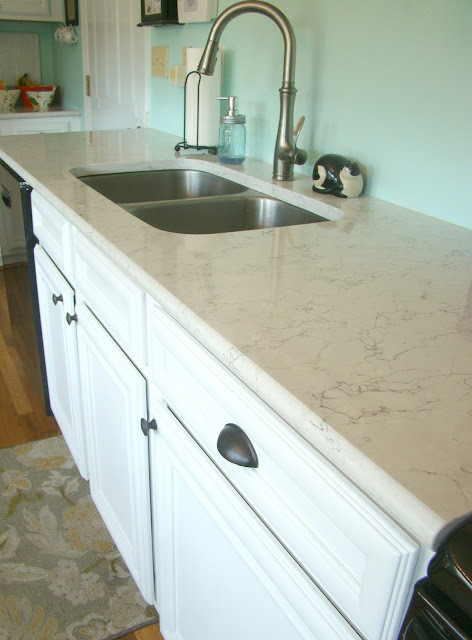 It is Silestone Quartz in White Arabesque, and we got it from Home Depot. Quartz is super hard and durable, and looks and feels like granite or marble. However, it's non-porous, and therefore anti-bacterial. It's so low maintenance and easy to clean. You don't have to use any special products, and you never have to seal it or do anything fancy to it! It's scratch and scorch resistant, and we love it so much. I know I sound like a commercial, but seriously. If you need some countertops, and you love the look of Carrara marble but not the price or necessary upkeep, get you some of these. They have a huge variety of colors and textures, and it's genuinely beautiful in person. I'm sorry this was so long, but it was many weeks in the making! My next project for the kitchen is to add a subway tile backsplash, and I will keep you posted on that. 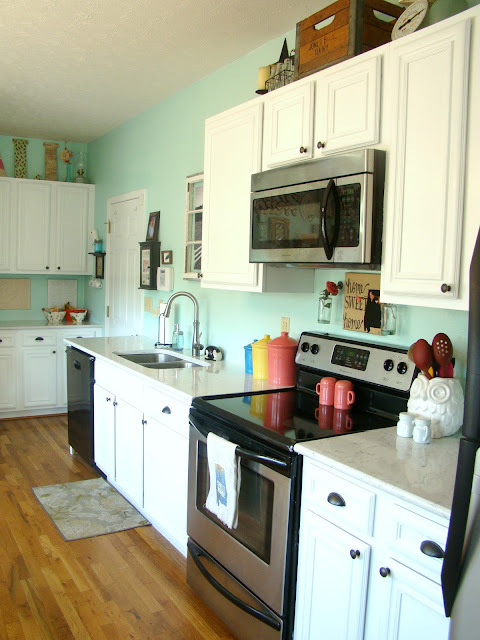 I hope you have enjoyed our kitchen reveal! Please say some prayers that the three-year-old doesn't get after these fresh cabinets with the crayons!